A Book and a Big Idea: Commotion in the Ocean - The Kennedy Adventures! 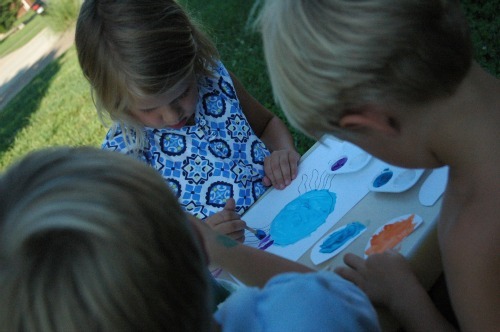 Since we love beach books for kids around here, we’ve been busy making ocean themed crafts this summer. We’re making jellyfish crafts, octopus crafts, and even some beach pudding snacks! We recently read Commotion in the Ocean, and my kids were delighted by the colorful story of ocean life. This classic book from Giles Andreae is a perfect anchor to a beach or ocean unit study. Each page depicts a different ocean animal. I even found this fun video on You Tube! My kids had a hard time deciding what ocean animal to craft, so we ended up with a variety. Lay the templates out on the work trays and let your children paint them. 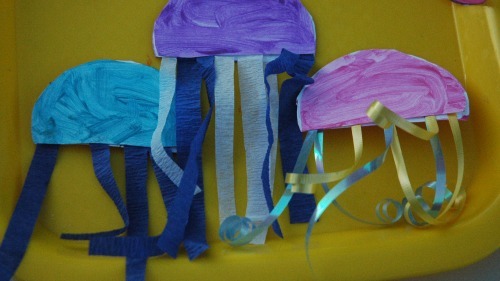 As they are drying, have them pick out colored ribbons and crepe paper to create the tentacles. When the jellyfish bodies are dry, you’re ready to put the pieces together. 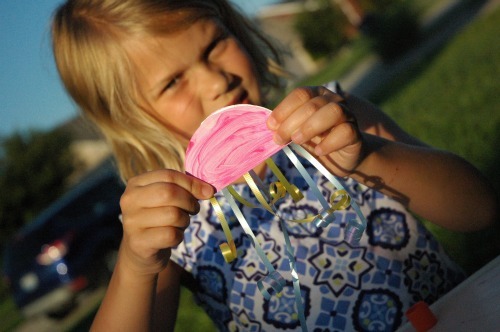 Take the glue gun or glue stick and attach the ribbons and crepe paper to the flat portion of the jellyfish body. Then, glue the two halves of the body together, leaving the flat portion open. This will allow the jellyfish tentacles to ‘jiggle’. Want to make your jellyfish puffy? Add a few cotton balls inside as well. 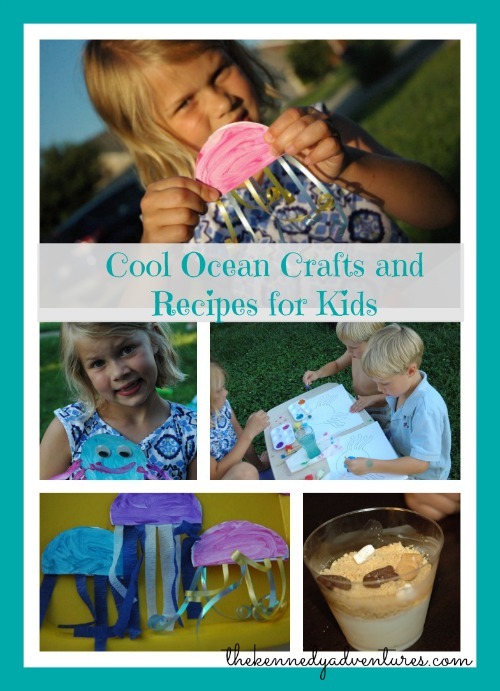 Looking for more beach themed crafts and books for preschoolers? Don’t miss this great list at The Homeschool Classroom. 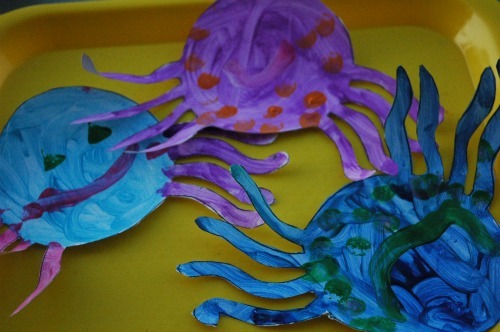 My children also worked on an octopus craft. For added fun, we searched out YouTube for octopus videos. 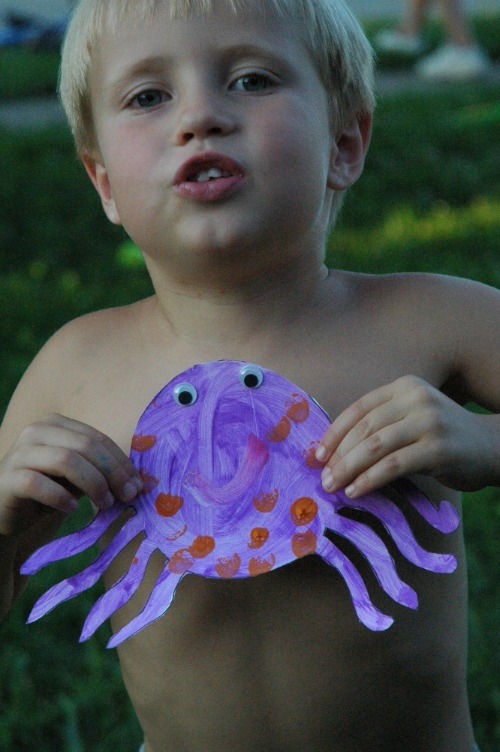 First, print this octopus template on cardstock, or trace onto foam sheets. 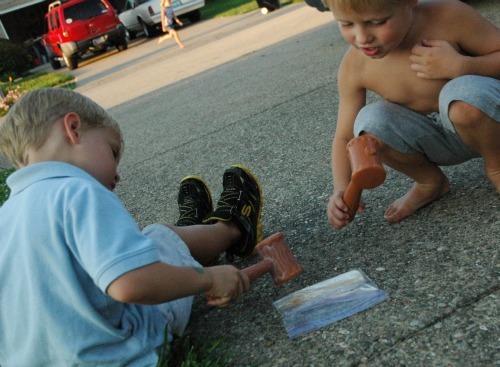 Do your kids need fine motor skill help? Let them work on cutting the octopus out with kid scissors. 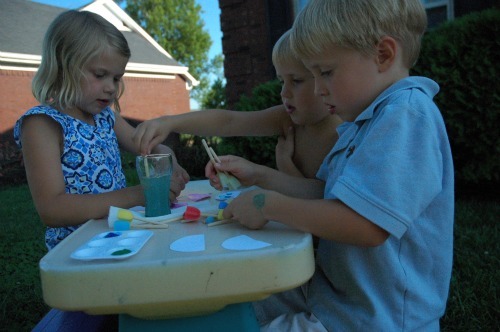 If you’ve got children who would rather not paint, you could use chalk pastels or Do a Dot markers for decoration. 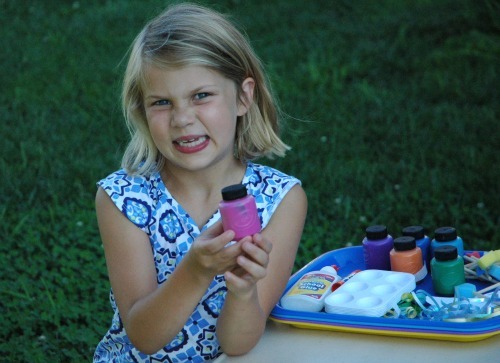 After everyone finishes painting their creations, sprinkle glitter on the wet paint and set them aside to dry. To create the suction cups, you can use circle stickers. You could also glue pony beads on for a three dimensional look. Add a bit of curling ribbon, and you can hang your ocean creatures in the window. After all that artwork, it’s time for a snack! 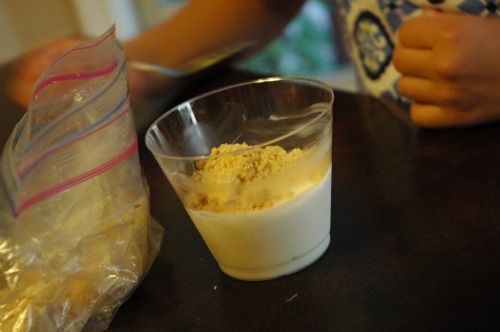 I surprised my children with some Beach Pail Pudding Snacks for fun. They’re used to healthy snacks, so this was way more fun! 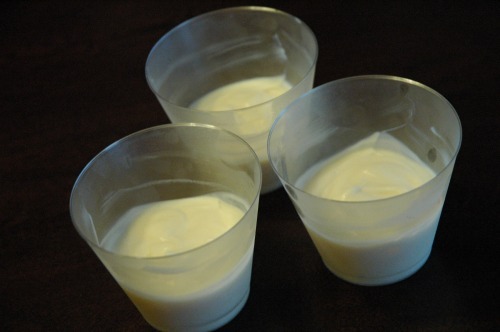 Mix the vanilla yogurt with a small amount of whipped cream. Fill the cups, then stick in the fridge. Put your kids to work, crushing up the cookies. Once your cookies are crushed, bring out your cups. 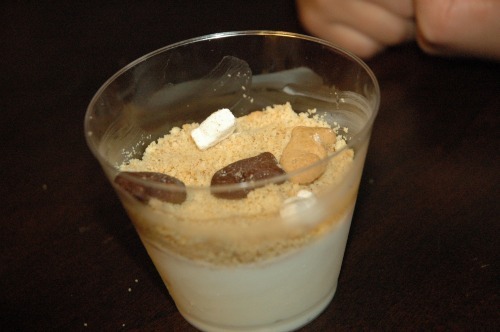 Gently spread the crushed cookie sand on top, and add fish. You can collect more ideas from my beach and ocean Pinterest board. Don’t miss my friends at iHomeschool Network for their Book and a Big Idea posts! 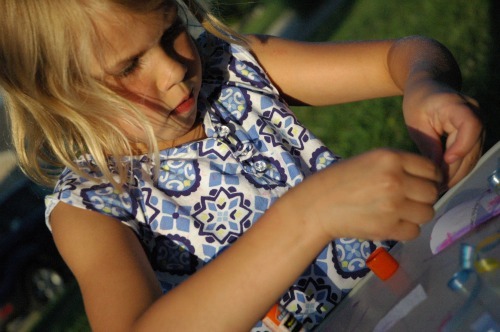 You’ll find crafts from books like Skippyjon Jones, The Kissing Hand, Blueberries for Sal and more. It’s going to be a great resource for planning homeschool crafts this fall! It looks like the kids had an amazing time putting together their crafts. The jellyfish are super cute. 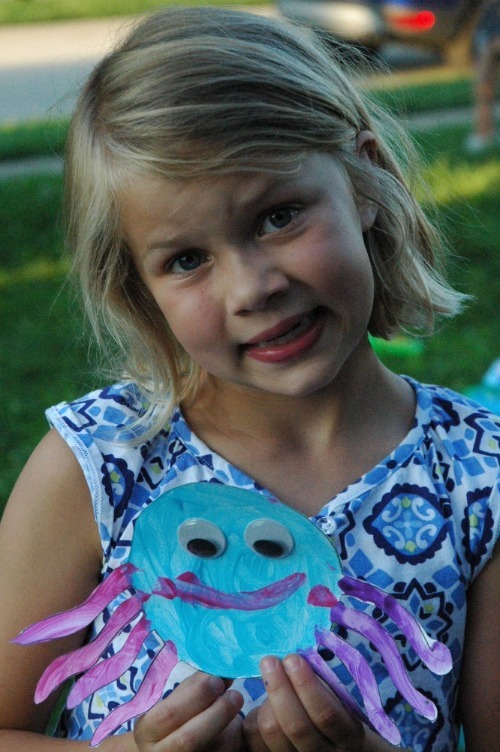 Cool ideas – love the jellyfish craft! Popping over from the Parenting Pin It Party, now following you on Pinterest – I’m pinterest.com/loveallblogs on there! Some great ideas. I love the jelly fish. Popping over from parenting pin it party. I will pin and follow. Cute crafts and the book looks like one my kids would love! I love book-related activities so much! Thanks for linking up to Raising Imperfection this week while I’m a co-hostess! Please come back to Mommynificent on Friday to see if you were featured. Thanks for joining in with MMM! Love the ideas Dianna – makes me wish I had preschoolers still 🙂 Lots of fun! I love all these adorable crafts! I think my daughter would really like the octopus! Love those jelly fish! They would make really cute gift tags. Thanks for sharing at the Love to Learn Linky.